By Charles Murray of "The Bell Curve" fame. Australians need to read this and work towards making sure we are not repeating the same mistakes. In the bestselling tradition of Hillbilly Elegy, the acclaimed bestseller than explains why white America has become fractured and divided in education and class In Coming Apart, Charles Murray explores the formation of American classes that are different in kind from anything we have ever known, focusing on whites as a way of driving home the fact that the trends he describes do not break along lines of race or ethnicity. Drawing on five decades of statistics and research, Coming Apart demonstrates that a new upper class and a new lower class have diverged so far in core behaviors and values that they barely recognize their underlying American kinship divergence that has nothing to do with income inequality and that has grown during good economic times and bad. 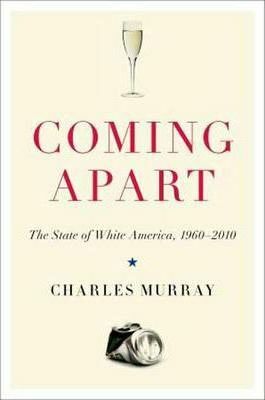 The top and bottom of white America increasingly live in different cultures, Murray argues, with the powerful upper class living in enclaves surrounded by their own kind, ignorant about life in mainstream America, and the lower class suffering from erosions of family and community life that strike at the heart of the pursuit of happiness. That divergence puts the success of the American project at risk. The evidence in Coming Apart is about white America. Its message is about all of America."